There is nothing as elegant, simple, and alive as glass terrariums. They are fun to look at and even help clean the air! 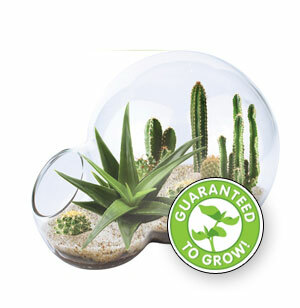 Grow your own miniature world in our high-quality glass terrarium. Simply add your soil, water, and seeds and watch your tiny garden take shape before your eyes! Your plants will conform to their container and require very little care once they are growing. Easy and fun to grow. Plant a desert on your desk. Over 15 different types of cacti included.